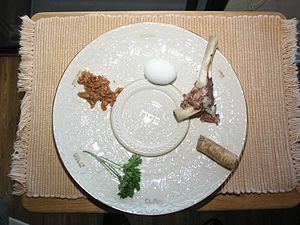 Today is the first day of the Jewish festival of Passover (Pesach). Although I’m far from religious, I can’t escape the cultural significance of the holiday and the time of year as it is one of the times that links the past recollections of family times with a strong cultural tradition of spending time together and recalling a communal history. It is traditional for families to spend this time together and the festival itself recalls the Biblical event of the exodus from Egypt and the importance of freedom. Freedom though, it is a concept that I’ve spent some time thinking over. It seems particularly valuable to linger on that definition a while in this days when the government (and opposition) are determined to divide the country into ‘deserving’ and ‘undeserving’ camps, into ‘working’ and ‘non-working’ where ‘working’ is good and non-working is bad and creating and extending a culture where we are judged on economic output and ability to earn alone. Freedom is challenging and breaking the divisions that our government is seeking to create. The castigation and alienation of immigrants, for example, when Cameron holds forth debates which link the extension of the ‘benefit culture’ and increasing immigration in the minds of the audience. Blaming the poor seems to be very popular by those in power. That is not freedom. That must be challenged. For me, that’s the importance of speaking against Cameron’s talk of those who come to this country and his maleficent linking between immigration and the benefit bill. He panders to an isolationism that breaks society into discrete sections. Divide and rule. 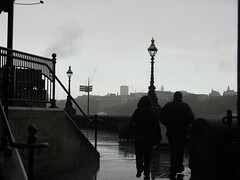 I find his words hard to compute with my image and idea of what Britishness is. What is it that makes Cameron’s home counties Britishness is so diametrically opposed to my urban Britishness? Experience and identity, I would wager. I am from immigrant stock but that doesn’t make me feel less British. Should it? I am unsure now. We have a long way to go to create the idyllic, accepting and yes, free, British society that I want to live in but I don’t want to live in a country that equates immigration with problems. I want to live in a country which does not criticise on the basis of ability or first language. Integrate, integrate, integrate – we hear. Surely the richness of the nation is the elasticity to accept diversity. I imagine Cameron would feel satisfied looking at ‘someone like me’. I seem integrated, I certainly speak English with an English accent. But I don’t want his approval or his distinction between ‘good’ and ‘bad’ immigrants. I don’t necessarily say there should be no immigration controls at all but I do believe that it is an easy bandwagon to jump on in times of economic hardship. It is a broken record. It is stuck on repeat. Blame immigrants. Blame difference. Blame disability and/or sickness. Blame benefits. It is a society that has created these systems that needs to be blamed and it is a foolhardy and base politician that plays on these lowest common denominators to pander to a public that feels frightened amidst harder economical times. But these are dangerous words from Cameron and we would do well to heed them. He does not have an understanding of my Britain, my England, my London where people do come and live from all over the world and are creating communities together. On the one hand he tries to praise communitarianism through his ‘Big Society’ approach but only if it is about Royalist Street Parties? My Big Society is very different from Cameron’s and the more he speaks the prouder I am of the society that I live in and the more I strive for the society that I want to create. The demonstration on March 26th? That was my society. The best way to counter these arguments of Cameron’s is to prove that we will not accept the agenda that has been laid down for us and to keep challenging the reactionary views that immigration only causes problems, that people who do not work are idle and that there are distinctions between deserving and undeserving poor. Freedom is an ethereal concept and while it means different things to many different people my hope for this coming year is that we stand up more as a collective and tell the government and those who claim to know what we want and what is best for us about a society works for us. Freedom is an equal and equitable society. The world is changing and sometimes we need to take a step back to see how it has changed. We have more opportunities for collective action that might have been possible in the past and have ever new ways of making connections and building links across divides which might otherwise have remained closed. In some ways, I have never been more optimistic about the possibilities for change that we can hold in our hands. We just have to seize back the debate and the rhetoric and perhaps that freedom and change can be within our grasp. So for those celebrating over the next week whether Passover, Easter or the Spring Solstice or for those simply celebrating the days of Spring as they arrive with a hopeful expectation, I hope we can all think about the importance of political freedoms over the next year and all that we can and must do to promote it. It’s easy to say that things need to be different as regards the welfare payment structure in the UK. Anyone could say it and to be honest, the system and the ways in which is it used and most of all the intricate complexities of the system beg for changes. So Cameron has got through the easy part there. Reform is overdue. The details however remain forthcoming. A ‘universal benefit’ of overarching status that will encompass current Jobseekers Allowance, Council Tax Benefit, Housing Benefit, Employment and Support Allowance, Tax Credits of various types – but, quite rightly, not Disability Living Allowance which will remain separate – will be merged into one type of system which will, apparently reward additional work undertaken rather than penalise it. Well, it’s hard to criticise the idea but to use a well-worn cliche’ the devil will be in the detail. The one thing that is frightening me about this system – although to be fair – it isn’t this system in particular, is the reliance on a fantasy ‘new computer system’ that will ‘just be able to work everything out’. Hmm. Heard that one before. As for changes in universal benefits such as child benefit, winter fuel allowance, free bus passes – I have no issue with those being more tightly controlled. There are a couple of difficulties with the agenda that is being presented though apart from the ‘fantasy perfect computer system’ that will know everything. Firstly, to push people back to work there have to be jobs to push people into. Secondly and perhaps more importantly, the government and the right wing press have pushed an agenda and a narrative of ‘benefit cheats’ and ‘malingerers’ into the public perception. This is no doubt going to be a precursor to cuts. We are, by nature a rather selfish society, looking to our own pockets before the needs of the citizen as a whole. If we see our next door neighbour who SEEMS to be doing very well on benefits with a nice new plasma TV, we will moan and groan ad infinitum about the base unfairness of it all. The truth is that no-one knows what is happening in someone elses’ life and household, the choices they might be making and the invisible disabilities they might be facing – but we all seem to become omnipotent when we are able to judge or compare what we, the perfect tax-paying citizen might be doing in comparison. I think this is generally a dangerous narrative and one that needs to be explored and questioned much more fully. There is an assumption that the ‘system’ is paying 5 million people not to work. I’d challenge that assumption. Of that 5 million, I assume that almost all are desperate to find good, dignified employment. Someone does not claim Jobseeker’s Allowance because they don’t WANT to work but because they cannot find work. Knowing personally a few people who have had to claim, I think that trying to make an assumption that these people are ‘rejecting jobs’ that are then taken by immigrants plays (unsurprisingly) into the narrative of the Daily Mail and the Sun. This needs to be challenged. The job centre system needs to be reformed but as long as we treat people who don’t have jobs as quasi-criminals rather than individuals with skills that can be utilised in different ways, we will perpetuate the ‘us and them’ system. Forcing people into jobs that have no match with their skill-set does not build an effective and strong economy. There is also an underhand ‘blame’ of immigrants ‘coming in and taking ‘our’ jobs’ that is perfidious in the extreme. Many of these ‘jobs’ that are being ‘stolen’ are taken by citizens of member states of the European Union. It may not be that British people are unwilling to take the jobs but more than our culture values different types of jobs differently or that we do not train sufficiently in certain skill areas. Cameron also promised today that unemployed people who refuse work would face tougher benefit sanctions, but gave no details. That’s a really useful statement, Mr Cameron – but with no details, it is completely valueless. At the moment, it sounds like empty crowd-pleasing rhetoric and a kick at people who are unable to find work – not because they are ‘being picky’ but because the manufacturing and industrial base of this country was torn apart by the previous Conservative government in the 1980s and because the global credit crash has affected the worldwide economy. Cameron has picked an easy target and uses crowd-pleasing words. That makes me nervous. I didn’t plan to watch ‘Saints and Scroungers’ on BBC1 last night. Really, I didn’t but it was nestled between The One Show and Eastenders (I never claimed to have particularly high brow TV viewing habits!) so it just happened across my TV screen. It made me feel very angry. That was my one sentence review. In more detail, the premise of the programme is to highlight ‘benefits cheats and to track down people who deserve government help’. Even typing that sentence made me feel faintly nauseous. It isn’t like it’s hard to find instances of people who have defrauded the benefits payments system, after all. You only need to (and I know, this is a big ask) read the Daily Mail where there highly skilled *cough* ‘investigative’ reporters are more than capable of fulfilling that self-satisfying smug need to ‘feel better’ that exists within the general populace. The ‘scrounger’ in this sense was an ‘unremarkable grandmother’ who had CONNED THE SYSTEM (a not-so-gentle reminder every now and then that that’s you and me, you know, The Taxpayer) out of £600,000 she wasn’t entitled to. Fair cop – it’s a heinous crime and she was caught. My problem is not that particular instance because it is a verifiable conviction from a repeat offender. My problem with the programme is the way it was couched in a self-satisfied smugness and a perception that the benefits system must be so easy to defraud that ‘we’ are all being defrauded. The cost of the reputation of people who are entirely entitled to live and receive welfare benefits is the perception that fraud is entrenched in the system. This programme was a case type in stigmatisation and alienation of people who might access welfare benefits and as such, although it highlighted evidence of a criminal offence, the language and presentation was such that we can all go and pat ourselves on the back for not claiming benefits. The ‘saint’ I thought initially was a young boy who had been paralysed in a motorbike accident whose mother was nursing him and who was CLEARLY entitled to all the money he received in payments. Actually, the saint was the Citizens Advice Bureau advisor who had told the family about all the benefits he had been entitled to. This part was equally nauseating. Firstly, the CAB advisor seemed quite happy to present herself as a saint. I know they do a good job – don’t get me wrong – I’ve come across countless amazing CAB advisors but it is hardly deserving of sainthood to advise someone who is very clearly an eligible recipient of their benefits. Also, alluding to this as ‘sainthood’ is a little cloying to say the least. It places an almost Victorian overlay of Deserving and Undeserving Disability. This young man clearly deserves our support. He looks the part and is well-spoken and able to talk to the cameras about his disability. I did have a brief thought about what the role of social services would have been in this case and how much they might have been deserving or not of ‘sainthood’ but to be honest, I’m glad they steered well away from this condescending and nauseating programme. I also wonder if it was a coincidence (and I’m sure it wasn’t intentionally done) that the person who defrauded the benefit system was an older black woman as opposed to a younger white man who was rightly receiving his entitlements and doing so ‘fairly’ according to the programme. I know it might be complete coincidence and I don’t doubt it wasn’t intentional but it does build on subconscious (or perhaps fully formed) prejudices and compound them which can be a dangerous thing in tough economic times. Why did I continue to watch it? I was tempted to switch over but then decided I might write about it… look what I do for you, dear Reader! In the end the feeling I was left with was not a satisfaction that my tax paying money was funding a poor, disabled boy and that police were working to route out the con merchant grandmother who was ruthlessly defrauding the state but an immense discomfort that I don’t need the payment of my tax money to be justified to me. I don’t want or care to be frank, whether those who receive ESA and DLA etc are good and honest people or not – they are entitled to that money regardless and no-one receiving a benefit to which they are entitled should EVER have to justify how they spend that money to anyone – least of all, me, an average taxpayer. Do we forget that people who don’t work are probably taxed the most harshly through indirect taxes? We are ALL taxpayers and I don’t want to feel that my taxes should be making me feel better. My taxes are also paying for the Trident Programme and I feel much more strongly about that than the odd benefit fraud to be honest – and whatever the media perception in – I remain convinced that there are far more people not claiming what they should and are entitled to than those who defraud the system. I don’t WANT to live in an society that does not have a fair benefit system. I can’t promise I’ll watch the next episode because this one was too much to stomach. And I really really don’t want my TV licence to be paying for such utter, pointless, cloying and irrelevant tripe. The Aesop ( Aetiology and Ethnicity in Schizophrenia and other Psychoses) study is controversial. Reported last year, the conclusion of this large study completed by the Institute of Psychiatry read that social rather than genetic causes for severe mental illnesses could be related to circumstances that may be more prevalent in the lifes of (particularly) African Caribbean community for example issues of family breakdowns, unemployment and I’d suggest poverty, all of which are more prevalent in minority ethnic communities. This study creates all sorts of problems. Even in my own office, I’ve seen the ‘I told you so’ attitude expressed by one practitioner who maintains the differences. I personally, while unable to debunk research carried out without exploring the methodology, have an understanding that poverty has a significant effect on rates of serious mental illness and our ability to cope – regardless of ethnicity. The Guardian, back on 9 December 2009, quoted Louis Appleby as saying that ‘New Horizons’ took into account this research study and has been written with this in mind, focussing less of different services and streams for people from minority ethnic groups but rather looking at personalising services to individuals across the board and – with the rest of New Horizons – shifting more attention to preventative matters. Today, the Guardian prints an open letter from a number of mental health campaigners and academics challenging the Aesop study, its conclusions and the way it has been reported. Quite rightly, the letter states that this conclusions tell us nothing new. We have known for a long time that there are higher rates of incidence of schizophrenia among minor ethnic populations however, there are reasons for this that might be related to the way and the stages at which diagnosis is made. The way in which this ‘finding’ about diagnostic patterns has been reported stigmatises and pathologises African ­Caribbean communities as being inherently flawed in some way that generates ‘mental illness’ – a throwback to the discredited Moynihan report in the US, which stated in 1965 that the African American family was a ‘tangle of pathology’. There is plenty of evidence on the nature and extent of institutional discrimination and racism in the British mental health system. Failing to recognise this and, even more seriously, singling out groups and blaming their lifestyle or culture is the thin end of a socially divisive wedge. If ‘social engineering’ is being called for, it may be more effective to apply it to mental health services and service providers, not to communities. Which (unsurprisingly if you look at the signatories!) makes the point far better than I could. I feel the loss of community and culturally based resources wouldn’t necessarily help Mental Health services in the long run and if we try to ignore the impact that racism on a personal level as well as on an institutional level has had on creating these societal constructs in the first place – we can absolve ourselves of responsibilities for the cause and blame minority cultures themselves for the situations that oppressions have set them within. Unsurprisingly the BNP (British National Party) – jumped on the Aesop Study – providing the ‘evidence’ for their beliefs of racial and ethnic superiority. That isn’t to say the research itself is necessarily flawed but research studies can be made to report just about anything we want them to. There is a research study around that can point to just about any issue and provide evidence for it or against it. The problem with producing evidence such as this is that it can shift responsibility. The responsibility though of creating environments in which the difference thrives, lies with the majority ethnic group as well. Difference is crucial to accommodate within services and if it is done in a way which acknowledges the significance of decades, nay, centuries of oppressive practices and institutional racism within the ‘system’, it will be far more effective – rather than trying to separate an individual from their cultural heritage or cut services that might be more tailored to different cultural and ethnic groups. It is most definitely a challenge for the New Horizons ‘era’ that we are moving into but hopefully one that practitioners on the ground, at least, will be able to address to some extent. I was disheartened at how quickly the appalling story of Edlington – where two young boys, aged 10 and 11, under the care of the local authority attacked two other boys and subjected them to what surmounts as torture almost to the point of murder – turned into a party political debate about ‘Broken Britain’. Firstly, there is no doubt that the case indicated is sickening. I’m sure that mistakes were made by professionals – as much as been said openly. But for the leader of the Conservative Party to extrapolate, as he did in a speech last week, that it indicates that society in Britain is ‘broken’ and lays the blame on the current government, reeks of mean-minded opportunism and a poor understanding and analysis of the country today. We shouldn’t forgot what the previous Conservative government did to break society and to break Britain – from the sell-off of social housing which has led to increased overcrowding and a more desperate rush for the homes that are available to the miners strike and breaking of the industrial base of the north of England, leading to greater divides between the North and South and the promotion of the ‘me’ culture. Cameron says we must as ask ‘deep questions about social breakdown. A few of the questions I would ask would be about the responsibility of government for every shocking story that emerges ghoulishly onto the front pages of the tabloids to foster the middle-class angst about the state of the country. I’m not saying there is no effect of social policy on some of the ‘issues’ that are raising themselves but relating them to one particularly shocking story is at best ingenuous and at worst, a use of the victims for the benefit of party political gains. I wonder how much Cameron, in his very cosy upper middle class ivory tower, has an understanding of poverty and how it affects and drives social mobility. It is hard for him to convince me of his desire to tackle poverty head on while he talks about policies that are based on the benefits to the middle classes that are so essential for the Conservative government – but this is the rhetoric that feeds perfectly to Surrey chattering classes. ‘Oh look at how awful ‘poor people’ are’. ‘The government is responsible’ ‘We should do something’ ‘See, dear, we have to find the money to send little Johnny to private school so he doesn’t meet yobs like this’ – it plays straight into the Mail reading crowd who can blame ‘other people’ and increasingly detach themselves from the rest of the population who might be less able to speak up or involve themselves in politics. The Conservatives have accused some on the left of playing up ‘class war’ issues in the run up to the election and emphasising the private school backgrounds of most of the shadow cabinet. I say that Cameron’s rhetoric about ‘broken Britain’ plays this line absolutely. It doesn’t seem to be ‘his’ Britain that is broken. It is the Britain of the underclasses or ‘other people’. Surely by having a greater understanding of the societies in which these crimes take place and those many communities where no crimes take place but where poverty is pervasive, he would have a better idea of what the country needs, rather than writing it off as ‘Broken’ which is an easy shot. I don’t think society is any more damaged than any generation has been. Crimes and awful crimes at that, have always taken place. We have more access to reporting them though. I work through all echelons of society from extreme and almost unbelieveable poverty to some pretty impressive townhouses that woudn’t fall short of a few million. I see pensioners with barely enough to eat and heat and having to make those choices on a real basis as well as retired stockbrokers and UN officials on very comfortable pensions. The pain and distress can be differently focussed but it exists in both just the same. I see much more that unites than divides – all the same being one community and one society. Society today has much hope in it – and many good people. I think of the young, unemployed neighbours of a rather grouchy elderly woman I worked with who redecorated her home and visited her daily for a chat just because they didn’t have anything to do – I see some kids who pop into a local residential home to chat to the residents in exchange for a cup of tea and biscuits or the young lad who offers to do bits and pieces of shopping for his gran’s friend who doesn’t have any family of their own. We don’t see this reported though. There is more good than bad in our society and in our young people. As a foster carer, I think of the young girl in the care of the local authority who is sitting in front of me as I type this and speaks of how she wants to make the world a better place and ‘help old people’ when she grows up (ahem. .I had no influence during our ‘what you want to be when you grow up?’ discussion.. cough.. cough) – but in her and the other children I have had the pleasure to have as guests in my home, I see a lot of hope for the future and for the society they grow up in and create for us to grow old in. What is needed by the Conservative and the Labour Party is firm and distinct social policies which will not focus on particular crimes but rather on resources being distributed more towards those who need it and where it is be best used rather than creating a side show of crime for the middle classes to guff at. There is no doubt that a lot can be done to make this country a better place to grow up and grow old. That doesn’t take as a baseline that all hope is lost at the moment though – but there’s nothing wrong in striving to make things better without writing off the society of today.